Start with fresh ingredients. Small batches of hand made chocolates. A quarter century of successful candy making in Cary, North Carolina. The results, wonderful chocolates. Our desire, creating chocolates that will make yours, a friend, or loved one's day that more special. Easter Sunday is April 21 this year. Things are hopping at the chocolate shop! Easter bunnies in Milk, White, and Semi-sweet chocolate. In many different poses and forms including sitting bunny, baby bunny, bunnie sitting on mushroom, car bunny, motorcycle bunn, golfer bunny, bunny driving a tractor and more! Sugar-free easter bunnies, and Peeps in sugar-free. 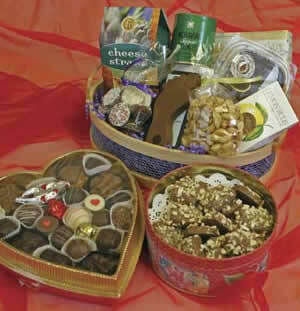 Chocolate baskets and eggs which can be filled with you choice of chocolates. Lots other items to make those Easter Baskets "Egg"stra special. We'll have extended hours the week before Easter Sunday. Check out our Contact link for more details. Yes, you can place an order for eggs and bunnies. We appreciate your business. Thank you for shopping local!